Liberal leader Michael Ignatieff takes notes during a presentation by CKUFV during a non-partisan morning meeting at Roesch Farms near Kent Bridge. The Liberal leader of the Opposition paid a visit to Chatham-Kent today during a swing through southwestern Ontario. Ignatieff attended a meeting with the Chatham-Kent Unified Farm Voice (CKUFV) to hear local concerns over the agriculture sector. 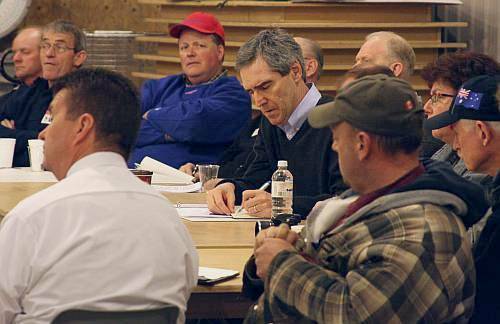 Listening intently and taking notes, Ignatieff heard from farmers who are still struggling under what they consider to be ineffective government programs. Alice Uher mentioned the economic importance of agriculture, and a short video was shown portraying the role of Ontario farmers. Louis Roesch, host of the event, raised the need for a fair policy to label foods as "Made in Canada" so consumers could identify those products legitimately originating here, without being so arbitrarily high as to restrict use of ingredients such as spices. "I hear you," Ignatieff replied, and suggested proper labelling could allow those products to be marketed better. Ignatieff told those assembled that the Conservatives promised big changes to farm programs, but only changed the name. Referring to the risk management program in Ontario, he stated to loud applause that, "I cannot see a good reason why federal agriflex funding cannot contribute to those programs." He stressed that despite representing urban Toronto, his roots in the farming community went deep. "The Ontario Food Terminal is in my riding. 30-40% of the industrial base of employment in my riding is you guys," Ignatieff pointed out to the farmers. "You don't just feed people, you employ a heck of a lot of people in my riding." 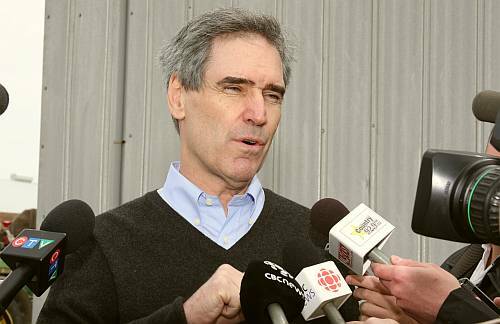 Ignatieff spoke with local media outlets following the meeting with members of the Chatham-Kent agricultural community. Adding to his earlier statements, Ignatieff stressed, "Urban Canada's got to understand how much it depends on rural Canada. This is a national unity issue." Following the meeting, Ignatieff met with the farmers directly, then held a press conference in the cold wind for local media. Ignatieff spoke of his morning conversation with the mayor of Windsor concerning the future of Chrysler's Windsor mini-van plant. With an unemployment rate already at 12%, mayor Francis worried about rumblings that the plant might close, spiking that rate to over 20%, and affecting nearly every other sector of the economy. "This has been coming at us since the Conservatives were elected and they've done nothing. They're still basically waiting for Obama." 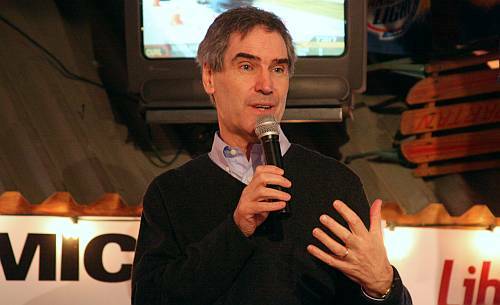 Ignatieff cited the need to work closer within the American system with regards to their uncompetitive farm subsidies, indicating the Americans promise free trade on the surface but remain deeply protectionist. 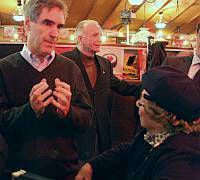 The next stop was a gathering of party faithful and general public at Crabby Joe's in Chatham, where Ignatieff addressed a standing room full of supporters. He stated that the Conservative strategy is to please only the core 37% of the population that supports them, while pitting everyone else against each other. Ignatieff contrasted his Liberals as an inclusive party that would govern for everyone and every region, without the divisiveness and confrontational style favoured by the Harper government. Concern was expressed by Ignatieff over the different criteria required to qualify for Employment Insurance depending on a worker's address. He said there were six different qualifying requirements in southern Ontario, and pledged to make the system more fair. Following the speech which he gave without notes or teleprompter, the leader took unvetted questions from those gathered. 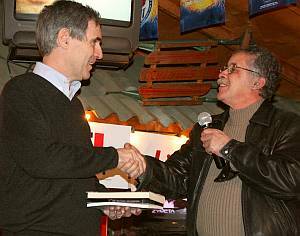 Speaking during a lunchtime gathering at Crabby Joe's in Chatham, Ignatieff took questions and rallied party faithful. The event was open to anyone. Municipal Councillor Larry Robbins asked Ignatieff's position on pensions for seniors, and a high-speed train between Windsor and Quebec City. Ignatieff praised Paul Martin's overhaul of the CPP in the 1990's that guaranteed a sustainable pension fund would be available for seniors, though he felt more needed to be done in other areas to ensure seniors are looked after. Ignatieff pledged his support for the high-speed train proposal, and suggested it would be a unifying policy for the country. Local Liberal candidate Matt Daudlin added that he wanted to see the manufacturing required by such a project to be performed right here in Chatham-Kent to take advantage of our highly-skilled workforce and competitive cost of doing business. Also mentioned were intentions to reintroduce a Liberal plan to clean up pollution hotspots in the Great Lakes that the Harper government axed. Ignatieff felt that we need to address our aging St. Lawrence Seaway infrastructure to meet current demands and take better advantage of the economies of transporting goods by lake freighter. In appreciation of his visit, Ignatieff was presented with several books by noted author Bryan Prince. Ignatieff rallied supporters to help elect a Liberal government. He stated this must be done one riding at a time, through the hard work of volunteers. He concluded with a reminder that in 2017, Canada would be celebrating its 150th anniversary, and he wanted Canadians to start thinking about where we want our country to be in just a few years. Local politicians attending events today included Councillors Brown, Weaver, Robbins, Pickard, and Pinsonneault, along with the mayor of Leamington, MPP Pat Hoy, retired MP Jerry Pickard, and the Chief of Moraviantown. Mayor Randy Hope was expected to attend but did not show up, missing another chance to advocate better support for farmers and municipalities. Following lunch at Crabby Joe's, the leader was off to more meetings in London and Hamilton. Ignatieff personally greeted those in attendance. Here, Chatham resident Fran Crummer chats with the Liberal leader.